The relatively stronger U.S. dollar encourages of Canadian automotive exports by increasing American demand. Canada’s auto sector benefits from a low loonie and cheap oil, a new report has found. The Automotive Policy Research Centre in Hamilton, Ont., says the Canadian auto sector moves in the opposite direction of the dollar and one of the country’s most precious natural resources. The report, titled The Effects of Exchange Rate Fluctuations on Canada’s Automotive Industry, found what it calls a statistically significant correlation between Canada’s total motor vehicle GDP and the exchange rates between the Canadian dollar and the currencies of four of Canada’s largest automotive trading partners: the United States, Japan, Mexico and South Korea. Ken Delaney, the author of the report, said the results of the study didn’t surprise him. “We confirmed what we thought,” Delaney said. “But there was some discussion that the exchange rate was not that important. “Some people were saying that the market is so integrated that the exchange rate is a wash. That’s one reason we did the study. Combined, the four countries studied account for approximately 97 per cent of Canada’s total automotive trade, including exports and imports. But the United States and Canada have remained each other’s largest automotive trading partners despite the increasing globalization of manufacturing and the effects of the North American Free Trade Agreement (NAFTA). 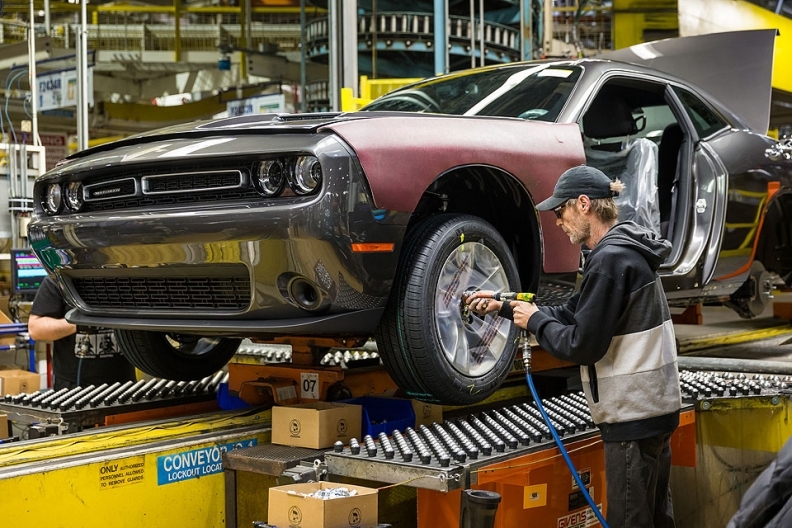 In 1999 the United States was the destination for 98 per cent of Canada’s automotive exports, while in 2014 it accounted for 96.9 per cent, according to the study. In contrast, Canada’s automotive imports from the United States declined noticeably over the same period, accounting for 82.1 per cent of Canada’s total automotive imports by value in 1999 but only 64.1 per cent of imports by 2014. The Canadian dollar spent much of the 2000s in a position of relative weakness when compared to the American greenback. However, as the U.S. economy declined immediately after the 2008 recession, near parity between the currencies was achieved. Since the loonie’s peak of nearly US $1 in 2011, there has been a steady decline in its value and a reversion to pre-recession levels in the United States. 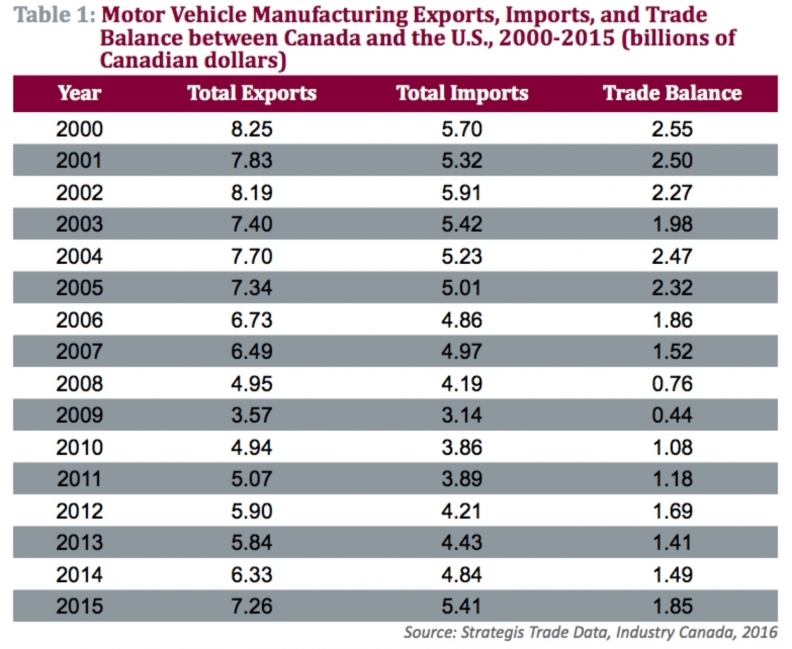 Over the same time frame, Canada’s value of motor vehicle exports in 2000 was $8.25 billion while the import value from the United States was $5.70 billion, resulting in a positive automotive trade balance of $2.55 billion. But in 2008 and 2009, as recession swept across the United States and the loonie gained strength, there was barely a trade imbalance. With Canada sending less vehicles and auto parts to the United States, its trade positive auto trade balance was less than $1 billion in each of those two years. In 2015, as the Canadian dollar weakened, the auto export and import values have returned to almost the same levels as in 2000. Delaney said it’s true that “nobody was buying cars, nobody was making cars,” during 2008 and 2009. But despite that fact, it was the dollar, not the U.S. employment rate or ability for Americans to afford cars, that slowed Canada’s auto exports. The United States is the only automotive trade partner studied with which Canada maintains a positive automotive trade balance. The United States is the only automotive trade partner studied with which Canada maintains a positive automotive trade balance. The surplus has been driven entirely by the positive balance in assembled motor vehicle trade, as Canada has consistently run a negative trade balance in motor vehicle parts since signing the Automotive Products Trade Agreement (AutoPact), a precursor to NAFTA, with the U.S. in 1965. One explanation is that the relatively stronger U.S. dollar encourages of Canadian automotive exports by increasing American demand. 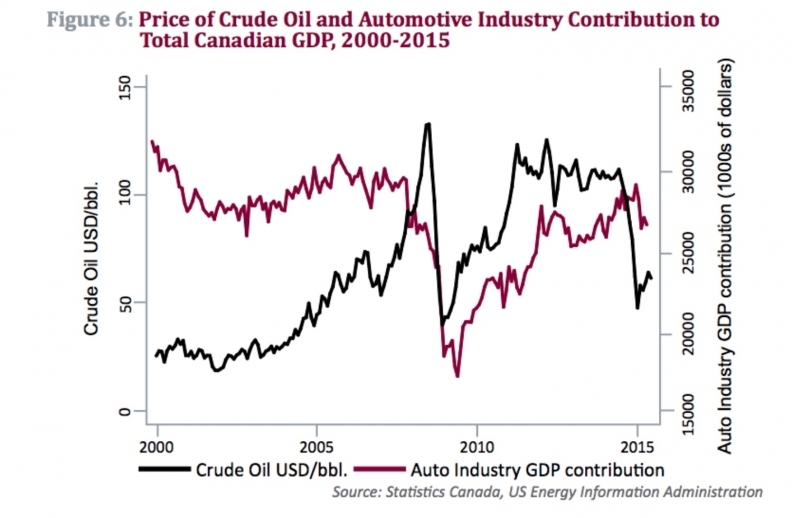 The Canadian auto industry is also affected by the price of oil. Canada is one of the largest exporters of the commodity, and the latest oil crash led to the depreciation of the loonie. The Canadian dollar’s value has been increasingly tied to crude oil prices, Trends in the dollar’s value and oil prices overlapped during the sample period, particularly during the recession and since 2015, when both began to decline, the report found. Appreciation of oil makes exports less competitive in international markets and harms manufacturing. Conversely, the report says a rising cost of oil puts “upward pressure” on the Canadian dollar. “Appreciation makes exports less competitive in international markets and harms manufacturing, and, as a result, negatively impacts economic growth,” the report reads. The dollar also affects labour costs. A weaker Canadian dollar decreases labour costs, an attractive feature for manufacturers. But Canada’s auto sector is not only influenced by currency. Other factors that contribute to Canada’s automotive GDP include a low corporate tax rate. Its rate of 26 per cent in 2013 was better than both Mexico (30 per cent) and the United States (40 per cent).